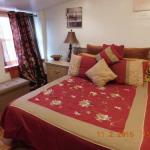 Debbie's Place is a self-catering accommodation located in Brooklyn. Free WiFi access is available. The property is 3.4 km from Barclays Center and 13 km from Coney Island. The apartment will provide you with a TV a seating area and a CD player. There is a full kitchen with a microwave and an oven. The private bathroom also comes with a bath or shower. You can enjoy garden view from the room. At Debbie's Place you will find barbecue facilities. The property offers free parking. If you feel like visiting the surroundings check out Brooklyn Museum (2.9 km) and Brooklyn Botanical Gardens (3 km). Newark Liberty International Airport is located 21 km from the property.